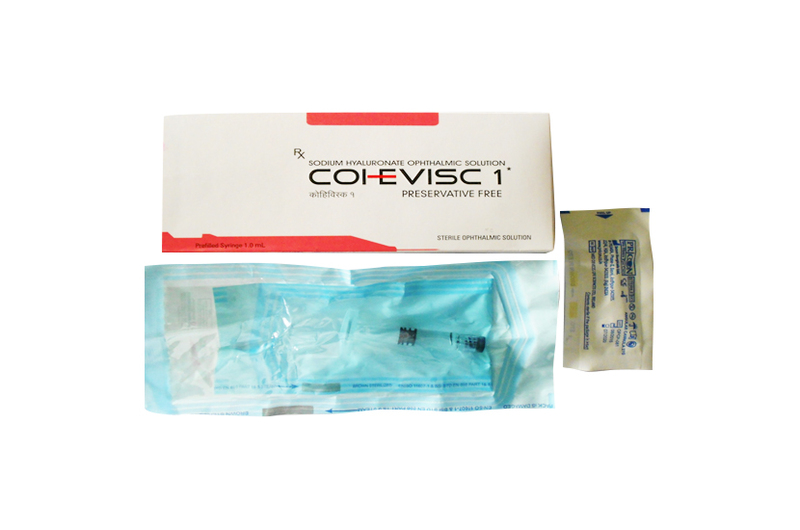 Cohevisc Ophthalmic Solution (Sodium Hyaluronate 1.0, 1.4 & 1.8) is a cohesive high quality viscoelastic formulation. It has high molecular weight, high pseudoplasticity, and high surface tension. Facilitates IOL implantation can be easily removed. Better Increased protection to corneal endothelium. Good maintenance of the anterior chamber and capsules. Secondary Packing - Carton box, 27G Sterile Cannula. Surgical procedure detach the retina. Cohevisc, visco ophthalmic surgical device is indicated as an aid for ophthalmic surgical and anterior segment during cataract extraction and IOL implantation. Cohevisc helps to maintain a deep anterior chamber during anterior segment surgery reduce trauma to the corneal endothelium and surrounding ocular tissue. It helps to push back the vitreous face and prevent formation of a flat chamber during the surgery. No contraindications known when used as per instruction. Available in 1mL Sterile pre-filled glass syringes & 27 Gauge Cannula. one syringe & 27 Gauge cannula packed with double pouch printed labelled & carton and carton packed in corrugated box.